On this page you will learn tips and tricks for unpacking, planting (in the ground or in a container), watering and caring for an avocado tree. Wondering which Avocado tree is right for you? CLICK HERE to read our avocado tree selection guide. Congratulations on your purchase of an avocado tree from Tomorrow’s Harvest® by Burchell Nursery! We have made every effort to pack and ship your tree so that it arrives in pristine condition. If for any reason, you are not completely satisfied with the tree you received from Tomorrow’s Harvest, please let us know immediately. 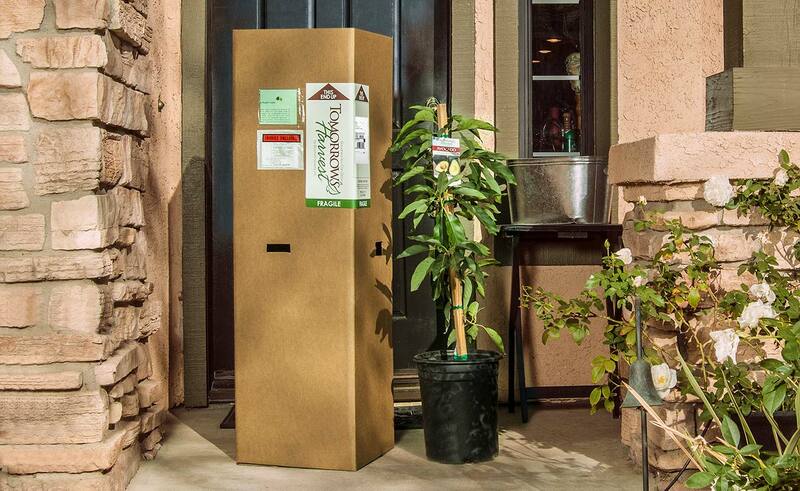 After unpacking, give the tree a light watering to settle any soil loosened during shipping. Always keep soil moist, but never soggy or dry, so approach irrigation by need, not by ‘schedule’ (every so many days). Do not transplant the tree right away. Instead, keep the tree in the original container it arrived in for several weeks, because avocado trees really like to acclimatize to new surroundings before being planted. Even if this is several weeks to several months, the tree will continue to grow. Just be mindful of the soil moisture as mentioned above. When you do transplant the tree, slice the can down in two places with a pair of shears and peel it away from the root ball (like a banana). With one hand on top of the root ball and one hand below, gently remove the tree from its container and place it in the hole. Do NOT manipulate, tear or break the root ball at all, as avocado trees do not like that. Expect leaf drop; it’s just something avocado trees do. New leaves will grow back. In the winter you may lose more, but this should be followed by a good growth flush in the spring/summer. If you live in an extreme Winter area, choose a dwarf tree that will grow in a large, moveable container indefinitely. That way, you can move the container outdoors on a porch or patio for the growing season, and then move it indoors for the Winter. While indoors, choose a spot with bright light (avocados like full sun). You can use a grow light on a timer if you wish. Keep the tree well away from any direct source of heat or air movement (such as heating vents) and do not place your avocado tree in a room with a fireplace. While indoors, spritz some moisture on the branches and leaves once or twice a day as a way to increase humidity levels near the stem and foliage, but water only as needed. How to plant an avocado tree in the ground. How to plant an avocado tree in a container. Click HERE to learn some great avocado specific tips and tricks about longer term care and how to feed your new tree. As excited as you’ll be to welcome your new avocado trees home, give them time. Don’t plant them right away – let them get settled after their journey. And don’t be alarmed by leaves dropping, as this is to be expected, kind of like the way an evergreen tree sheds old, tired needles. Just keep your trees in their original container for several weeks or even months. Be sure to keep the soil moist – neither soggy nor dry – so water as needed rather than on a set schedule. Once your trees are ready to really put down roots, be sure they’ll have well-aerated soil. This is important because their feeder roots prefer a shallow lie, staying within about 6 inches or so of the surface. When you and the trees are ready – preferably between March and June – choose a site that gets full sun, but has some protection from wind and is away from lawn areas. Dig a hole as deep as the root ball and little bit wider, then ease the tree down in. Don’t disturb the roots unless the tree is root bound. If that’s the case, loosen the soil around the edges of the root ball and trim away any growing in circles. Fill in the hole with soil and water well – new trees can be thirsty, and want about 2 gallons of water when planted. Add some mulch around the tree, such as tree bark, but keep it at least 6 inches away from the trunk. If you live where it’s cooler than USDA zones 9 to 11 (find your USDA Zone Here), you can still enjoy an avocado tree planted in a container on your patio and bring it indoors when the temperatures drop. We offer several dwarf varieties that can do well in containers, and you can prune them to stay 8 to 10 feet tall. But first things first – as excited as you’ll be to welcome your new avocado trees home, give them time. Don’t plant them in a new container right away – let them get settled after their journey. And don’t be alarmed by leaves dropping, as this is to be expected, kind of like the way an evergreen tree sheds old, tired needles. Just keep them in their original shipping container for several weeks or even months. Be sure to keep the soil moist – neither soggy nor dry – so water as needed rather than on a set schedule. To grow your avocado tree in a container, use soil that’s a specialized planting mixture designed for avocados, and add in some cultivated soil from your garden. Choose a container size at least twice as large as the shipping container, large enough to allow your tree room to get established and grow. You’ll need to transplant it to a larger container later as it outgrows its first one. 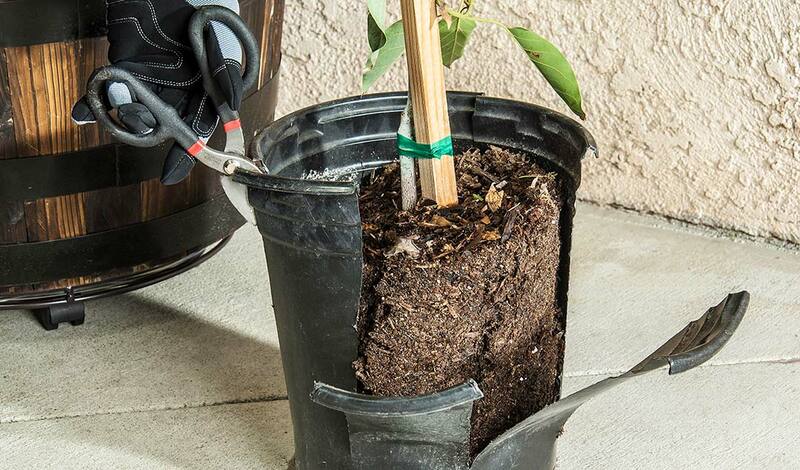 Ease the tree’s root ball down into the container, and don’t disturb the roots unless the tree is root bound. If that’s the case, loosen the soil around the edges of the root ball and trim away any growing in circles. Fill in around the root ball with your soil mixture and water it well. You’ll also want to use a stake to keep the stem straight as it grows. When the weather chills and you go to move the tree from indoors, remember a few things. Your avocado tree will still need good light. You need to make sure the indoor spot is a bright one, though it shouldn’t be in a direct southern window because the tree can get burned. You want as much light as possible for it without being in those hot southern rays of the sun. If you’re worried you don’t have the perfect spot, you could augment your natural light with a grow light on a timer. Your avocado tree won’t like high temps and the dry heat of your home, so don’t let it be in an area that is 80 degrees or above. Keep it away from a direct source of heat or air movement (away from the vents), and definitely don’t put it in the same room as a fireplace. To counteract the dry indoor air of a heated house, it helps to regularly spritz the branches and leaves with water. Avocado trees are tropical in nature, so they’ll need regular, even frequent, deep watering. This means 2 to 3 times a week depending on the weather, but let the soil dry between watering so the roots have access to oxygen. This also prevents root rot. Of course, you don’t want to let your trees get too dry, but avocados don’t like cold, damp or soggy soil. As your trees become more at home and the roots reach out into the surrounding soil, you can give them more water less frequently, maybe about once a week by the end of a year since planting. There’s no need to prune your avocado trees unless you have damaged areas to remove, or if your trees are in containers and you want to control just how big they get. After planting your avocado trees, they’ll need to be fertilized three times in their first year in the ground – around February/March, July and September/October. Don’t fertilize them after that third feeding, as they need to go dormant in the winter. If planted in a container, you may want to fertilize with water-soluble food monthly. As the trees mature, they’ll need less frequent fertilizing, about twice a year during the growing season. Avocados that are older than a year old do well with some nitrogen and a little zinc. You can use a 10-10-10 or 7-4-2 NPK mix, (nitrogen, phosphorus and potassium), and look for one that also contains zinc (Zn), or go organic with compost, coffee or fish emulsion. But don’t fertilize too heavily. Too much and you’ll damage the feeder roots that are so close to the surface. In fact, you don’t have to fertilize, it’s just that a little fertilizer will help your babies grow faster and be healthier. With proper care, you can look for your first fruit in three to four years after planting. By five to seven years, you might see 200 or more fruit per tree! But avocados typically alternate bear, which means they may give you a large crop one year and a smaller crop the following one. But even in a smaller bearing year, you’ll be in guacamole heaven. And avocado trees have been known to continue producing fruit as long as they are alive. It’s known that some trees in Mexico are more than 400 years old and still blessing their owners with fruit.